Getting married indoors when the sun in shining and the weather is a perfect 72 degrees may seem like a waste of a beautiful day. Dreaming of a wedding day that’s both elegant and leisurely, glitzy and enchanting? Garden party weddings combine the best of both worlds. Consider these eight ideas when planning your perfect outdoor wedding surrounded by flowers, friends and fun. Photo courtesy of Green Wedding Shoes. 1. Think outside the box when it comes to your ceremony and reception location. Great backdrops for a garden party wedding include public parks, historical sites, private estates and, of course, botanical gardens. Make sure that your venue has an indoor area or tents set up in case it rains. A Note About Offbeat Locations: If you’re getting married somewhere that’s less-than-typical, make sure to ask a lot of questions about accommodations. Is the building too large for a small wedding? 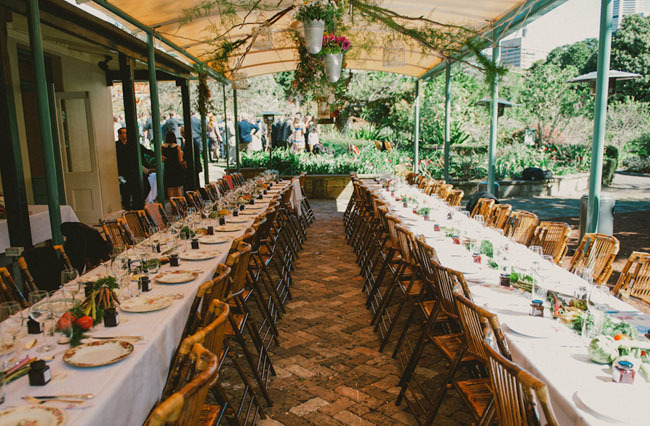 Some historical sites or estates may be overwhelming for an intimate wedding with just 50 guests. Are bathrooms easy to get to and roomy enough for the bride to freshen up in? Is there enough parking close by? 2. 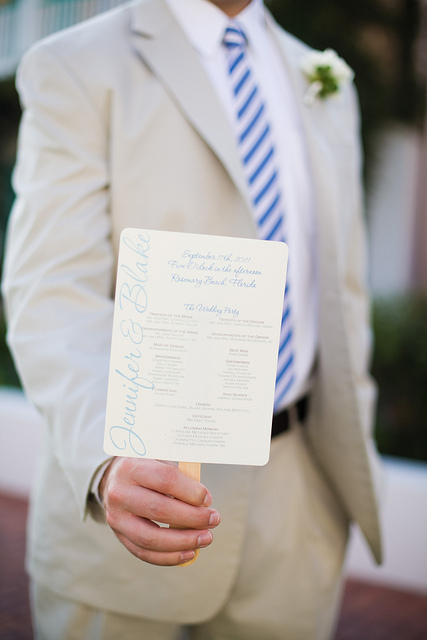 Hand out ceremony programs that also double as fans. 3. Garden party weddings usually take place in the spring, but try not to overdo it on the pastels. Keep your color scheme simple with two hues – one bold and bright, the other neutral or a neutral metallic. At most, choose three colors: one bold, one pastel and one neutral. 4. Unless you’re okay with the bottom of your gorgeous Vera Wang gown being completely destroyed by the end of the night, choose a wedding dress that either has no train or that can be bustled. At a garden party, you’ll probably be traipsing over dirt and gravel, which can destroy a hem in no time. 5. A garden wedding can be the epitome of chic and sophisticated, but there’s still something fun and whimsical about the motif. 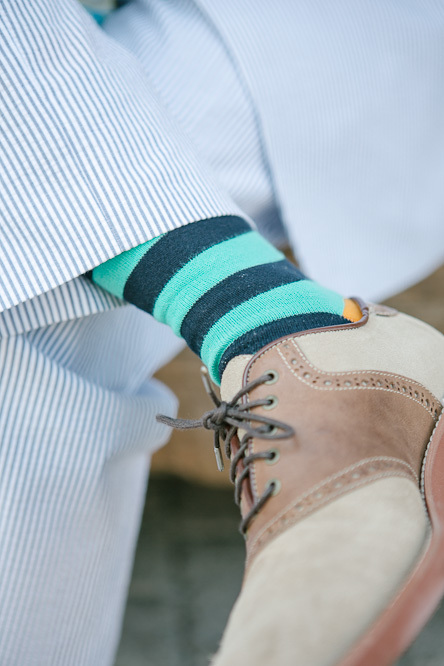 Have your groom and his groomsmen wear funky striped socks – they’ll only show when the guys want them to, like for a photo. Photo courtesy of Backyard Huppah. 6. 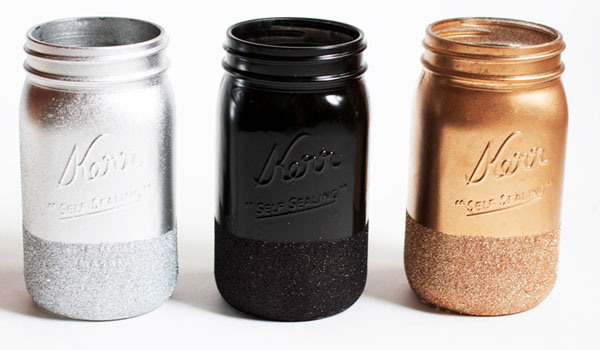 You can use mason jars for a number of different things. Turn them into hanging lanterns by adding a flameless candle and stringing them to branches; serve lemonade and iced tea in them; or dip them in glitter and insert a tea light to create sparkly centerpieces. Photo courtesy of College Candy. 7. 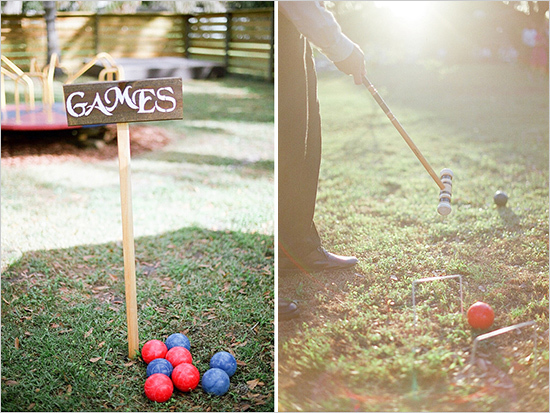 What garden party would be complete without a few games? Designate a recreation area with wooden signs and set up croquet, horseshoes and bocce ball. 8. Spring or summer garden party weddings tend to be held outside. If you’re lucky enough to get a sunny wedding day without a cloud in the sky, make sure that there’s somewhere for guests to get some shade. Or you can provide parasols, which serve a practical purpose and will also look charming in photos. Did you get stuck with a rainy wedding day? Use it to your advantage – all those umbrellas make great photo props, too!